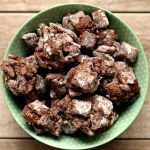 Chunky Muddy Buddies–do you love chex muddy buddies but wish there were more of the stuck together chunks? I prefer my muddy buddies this way too and have tweaked the recipe so that it’s basically all chunks. More peanut butter, more chocolate, more deliciousness. 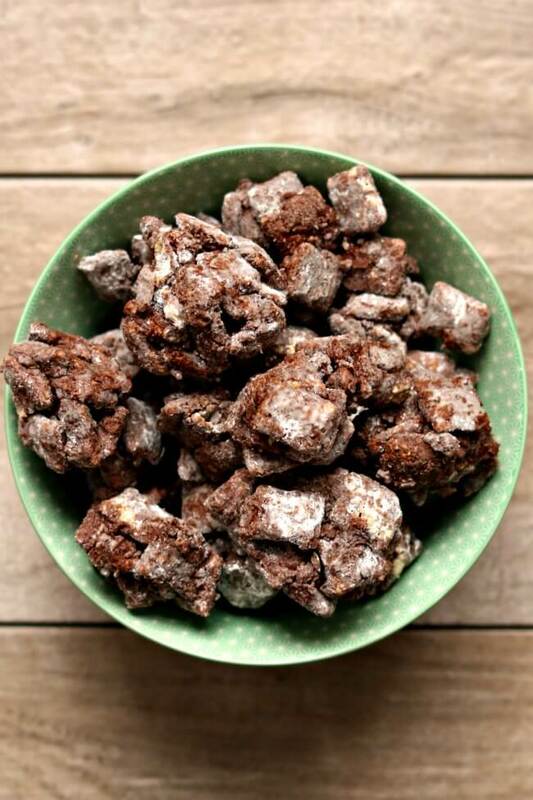 We all love muddy buddies, puppy chow…whatever you want to call it. How can you not? It’s a piece of cereal enveloped in chocolate and peanut butter and then tossed with powdered sugar. Whenever I make muddy buddies I immediately pick out all the chunks that have gotten stuck together and eat them as fast as possible. Then I leave whatever is left for everyone else. I decided that I needed to make a batch of muddy buddies that had all the chunks and none of the pieces that are sort of dry. It worked really well and I will probably make it this way from now on. If you like individual pieces of cereal that are perfectly coated in powdered sugar then you’ll probably not like this recipe. But if you like the fudgy chunky pieces, this recipe is for you. 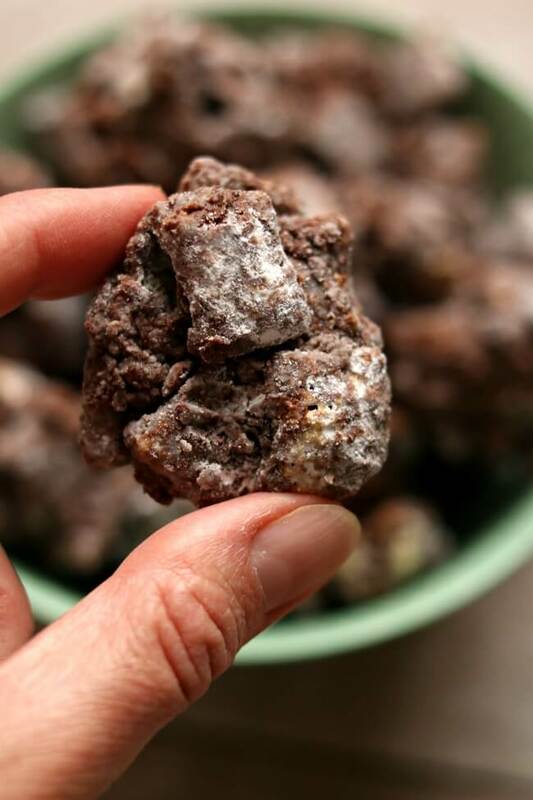 Do you love chex muddy buddies but wish there were more of the stuck together chunks? I prefer my muddy buddies this way too and have tweaked the recipe so that it’s basically all chunks. More peanut butter, more chocolate, more deliciousness. In a glass bowl add the butter, chocolate chips and peanut butter. Put in the microwave for 1 minute. Stir. Put it in the microwave for another minute. Stir until creamy. In a separate extra large bowl with a lid pour the entire box of cereal. Scrape the chocolate mixture over the top of the Chex. Stir and try to coat all the pieces of cereal. Sprinkle the powdered sugar on top and seal tightly with the lid. Shake the container vigorously for a minute. Refrigerate for about 30 minutes and then eat and enjoy! 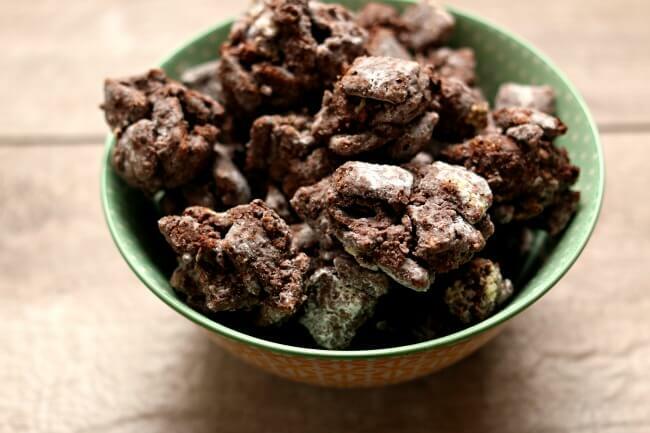 Like this recipe for Chunky Muddy Buddies? Get all my new recipes delivered to your email inbox by signing up below. The Chunky Muddy Buddies sound really good. But I have a question about how this is storied. Can I store them in the pantry or do they need to be stored in the refrigerator? Hi Brenda, I like to cool them down quickly in the fridge initially so I can eat them as fast as possible. Then I store them in my pantry. Either way is fine. It’s a preference thing. This sounds delish! Thank you for the free Slow Cooker ebook! Happy Mother’s Day to you! !